Those of you that have been following my blog will know that my last attempt at an aquarium build ended in disaster one day at 1.30 am when the bottom of the tank cracked and started to leak, for those who are visiting for the first time may want to read my original post here. Well I finally decided to try again, the first thing was to get another tank, I tried for a few locally through a popular auction site, but most were pushed close to retail prices and me being me will not pay retail for second hand. So I tried a number of the online aquarium stockists and hit a brick wall with ‘kerbside delivery only’, now there is no way I can move an aquarium so I would need to arrange friends to be here at the same time as the delivery, now tying friends to being available for an 8 hour stretch on a working day is like pulling hens teeth. Next option buy one second hand from classified ads, prompted by a good friend one night I started to search and found a website that was new to me and whoa ! there was a beauty of an aquarium with complementary cabinet at a price I could not believe, so quick email of to the advertiser to check if it is still available and the price is not a misprint and I provisionally ‘buy’ it with the understanding that the purchase is dependant on me arranging transport from near Bridgewater to Cardiff. So the hunt was on, I sent out about 12 emails in rapid succession to varies removals companies and man with a van types, sat back biting my nails waiting, knowing they are not going to hold the tank for me indefinitely. All I can say is that the companies I sent emails to obviously have too much work on to bother replying to emails, I got 2 replies, one saying they cannot help me the other asking for £445 to move it a mere 90 miles! Step in two good friends of mine who offer to do the move for me, one has a van so Sunday 5 Jan 2014 we set off to collect the aquarium, five hours later as it is being off loaded from the van and before it gets into my home someone offered me substantially more just for the tank alone, I resisted. 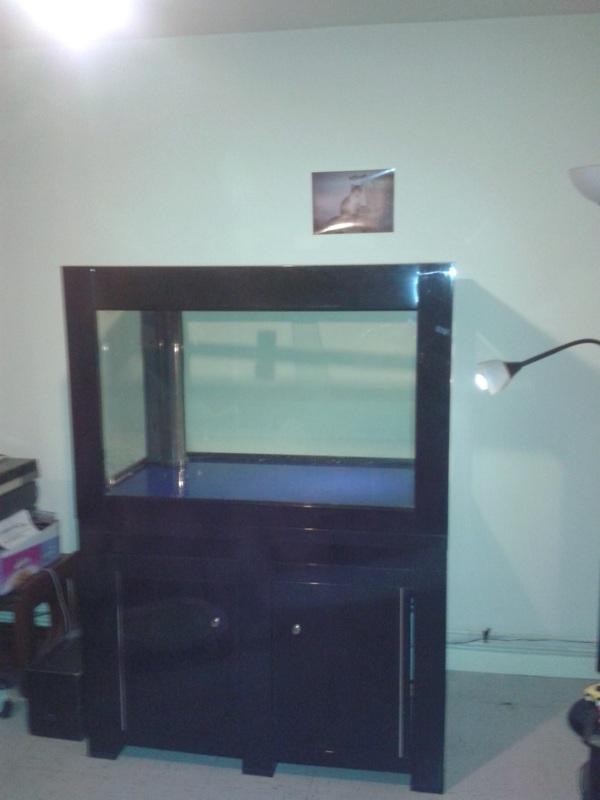 So it is now safely installed in my living-room and dominating it, I posted on an aquarium forum about using the sump with a freshwater but no one seems to have seen a set up like this before. The order has been placed for gravel, filter media, lights etc and all but the lights are due to be delivered tomorrow Jan 17th. This is how the whole aquarium looks without lights, gravel, plants, water, fish or my ever inquisitive cat.